Senior citizens at a NYCHA building in the Bronx are feeling especially helpless as their high-rise building floods for the fifth straight day. Rana Novini reports. A public housing building filled with senior citizens is flooding for the fifth day in a row, and the elderly residents who are being forced to take the stairs up the high-rise or go without running water are fed up. For five straight days, four separate pipe bursts have made 3135 Park Ave., a NYCHA building, a wet mess. Waterlogged personal belongings sit in the hallways, and flooding on the higher floors have knocked out elevator service. 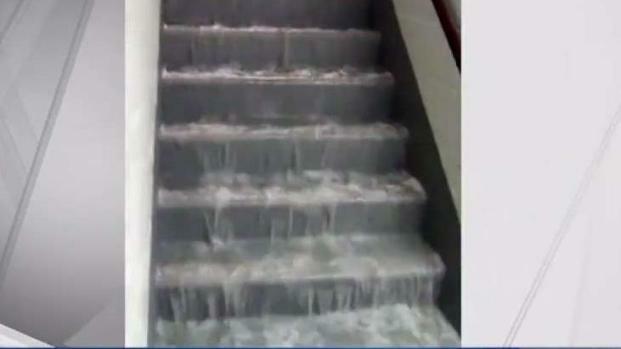 Elderly residents are being forced to take the stairs, and clean-up crews are trying to mop up what they can. Clarence Ferris said Thursday he woke up to about two inches of water on his floor. He's cleaned it up, but still has no running water. "When I woke up this morning I was surprised," he said. For the third straight day, water has been gushing out of dozens of Bronx apartments, this time on the 12th floor of the NYCHA building on Park Avenue near East 159th Street. Erica Byfield reports. "We had some blankets and put them here, and we thought we were safe." Another woman who lives on an upper floor had an asthma attack on a stairwell while climbing the steps. "It's pathetic! Pathetic, pathetic, pathetic," she said in desperation. People are at their wits' end, dealing with day after day of waterfalls on the stairway and being bound to their apartments waiting for a solution. "It's not fair that we pay rent, our rent keeps going up," said Beatrice Dickerson. "And what do we get? Nothing." A NYCHA official said staff are going door to door to help residents and remove water from affected apartments and shared areas, and are repairing the leak and working to bring elevators back online. Residents in NYCHA housing in the Morrisania part of the Bronx found themselves bailing out once again after their building is flooded. Checkey Beckford reports. "We understand our residents' frustration during this time and appreciate their patience as we work to resolve this issue and complete all necessary repairs. We must do provide all residents the safe, clean homes they deserve,"